The Hollister Premier One-Piece Drainable Ostomy Pouch is designed for individuals with colostomies and ileostomies. A one-piece system offers convenience having both the pouch and wafer together but an additional benefit is it offers a lower profile to be more discreet underneath clothing. One-piece, drainable pouches are recommended when the individual has more liquid stoma output. 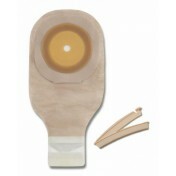 This allows them to drain the pouch easier with less disturbance of the stoma. Frequent pouch changes can irritate the stoma and therefore a two-piece ostomy pouch may be a better solution if you change the pouch often. To help maintain a healthy stoma during extended use, the Premier ostomy pouch is designed with a soft convex Flextend skin barrier with tape barrier to be gentle yet durable to resist erosion. Other important design features with the Premier is the ComfortWear panels that add a soft layer to the pouch to be extra gentle and comfortable against the skin. There is also an AF300 filter to deodorize gas in the pouch and slowly releases it. At the top there is a viewing flap to keep an eye on the stoma and the output. Lastly, a bottom drainage closure called Lock 'n Roll ensures a secure seal each time with its microseal interlocking fasteners. The Premier pouches come in a box of five in ultra-clear or beige. Choose from Cut-to-Fit or Pre-Sized to work with an irregular shaped stoma. The pouch also has belt taps when wanting to use an ostomy belt for added security during the day.